OMSK, Russia - In west Siberia, just as spring is unfolding in some parts of Russia, the Jewish community of Omsk was warmed by dual Brit Mila ceremonies held in their city. Two adult men decided to undergo this circumcision, which was performed by Rabbi Yeshaya Shafit, Russia's Chief Mohel who represents the 'Brit Yosef Yitzchak' Organization. 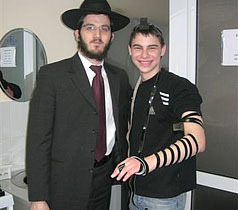 The Mohel traveled to Omsk especially to conduct these ceremonies for the two men. One of them, 15-year-old Vladimir, is an active member of the ‘Omets’ Youth Club run by the local community. Upon completing this ritual, the young man adopted the name of his grandfather, Benyamin. The other man, a 40-year-old named Igor, also took on the name of his grandfather, Shlomo. Chief Rabbi of Omsk Osher Krichevsky presented Benyamin a tefillin that was donated by the World Bank of Tefillins in New York. Shlomo received a separate gift consisting of the three major Jewish books - the Chumash, Tehilim and Tanya - all of which have been translated into Russian. These gifts should allow the newly-circumcised men to fulfill the covenant they made with G-d in their everyday life. The Jewish community of Omsk is a leader among those from Siberia that hold membership in the Federation of Jewish Communities of Russia.